The three oil marketing companies — Indian Oil Corporation (IOC), Bharat Petroleum Corporation, and Hindustan Petroleum Corporation (HPCL) — have together set a target of adding 42.5 million customers by the end of March 31. The rising number of Ujjwala customers is, however, increasing the government’s subsidy burden. The LPG subsidy during the first nine months of the current fiscal year has already crossed the last year’s mark by 23 per cent. The government shelled out Rs 25,700-crore subsidy during April-December 2018, compared to Rs 20,880 crore during the whole of FY18. The Budget for 2019-20 had, however, provided only Rs 20,283 crore in the Revised Estimates for FY19. The government expects the LPG subsidy to rise 62 per cent to Rs 32,989 crore next year. A part of this is expected to be rolled over from the current year. There were around 148 million LPG consumers in India on March 31, 2015. The number has increased by about 77 per cent to 261.6 million now. In January 2019, of the five regions, the northern region had the highest share in total LPG consumption of 32.8 per cent. The southern region had 27.2 per cent, the western region had 22.9 per cent, the eastern region had 15 per cent, and the northeastern region was at 2 per cent. Of the total number of consumers, around 242.7 million are covered under the direct benefit transfer of LPG subsidy or the Pahal scheme. Since the Ujjwala was started in May 2016, the government was also successful in adding another 68.9 million beneficiaries across 714 districts. Based on the scheme, LPG connections were initially provided to women in Below Poverty Line (BPL) families, with a support of Rs 1,600 a connection and its ambit was extended to “all poor” in December 2018. “With the number of consumers rising exponentially, it is time the government should consider further rationalising LPG subsidy,” said an industry expert. Those with family income of below Rs 10 lakh get subsidy for 12 cylinders. For March, subsidy on LPG cylinders is Rs 206 in Delhi. Companies have increased the prices of subsidised LPG in Delhi by Rs 2.08 in March, while the non-subsidised LPG rates have increased by Rs 42.50. 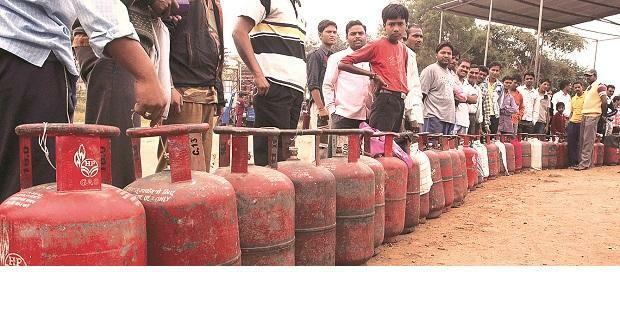 Without subsidy, an LPG cylinder costs Rs 701.50. The rising demand has made India the second-largest consumer of LPG, with 22.5 million tonnes (mt) consumed in 2017-18. This is expected to touch 30.3 mt in 2025 and 40.6 mt in 2040, based on a government estimate. LPG penetration in the country has also increased from a mere 62 per cent in 2016 to 90 per cent now. According to the latest data available with the Petroleum Planning and Analysis Cell (PPAC), total LPG consumption recorded growth of 11.1 per cent during January 2019 and a cumulative growth of 5.7 per cent for the period April-January. 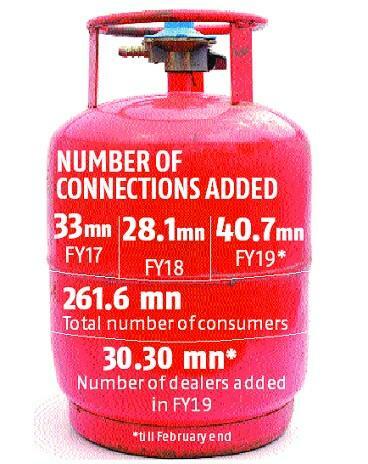 This year, 3,030 LPG dealerships were also added, compared to 724 in 2017-18. As of February 1, IOC has over 120 million customers, followed by 66 million for Bharat Petroleum Corporation, and 70 million for Hindustan Petroleum Corporation.